Dozens of children seen surrounded tortoise pen giant land located behind the Godong Ijo Cafe has not been this long. Godong Ijo itself is a tourist area of ornamental plants which are located in Jalan Raya Cinangka Km 10 No. 60, Serua, Sawangan, Kota Depok. Children of primary school age (SD) was seen engrossed the turtle who reputedly the largest in the world. Some of them have tried to hold the shell turtle is. There is also a rub-Wipe the turtle is. Although surrounded, turtles are not felt destroyed behavior by children. As though the turtle understand that children do not intend evil. Finance and Administration Manager Godong Ijo Jane Nadaek explain, other than the tortoise, python is in the sights of management is also reputedly the largest in the world. "Children who come here do not see or simply watch the animals, but can also touch. There are instructors who give referrals," he said. "Interaction with the reptiles is to improve self-confidence and courage of children. During this tour a lot of places that have only natural animal buffalo," said Jane Nadaek. In addition to touring the area as ornamental plants, Godong Ijo is a natural tourist attractions that have been achieved with the achievement get three se-ranked Indonesia as the Healthy Regions Tourism 2009 given by Ministry of Tourism. "Godong Ijo very concerned with the nature, because that is the achievement of Healthy Tourism Regions achieve. Concern is mainly in the embed program since early love of nature to children," said the Head of Section at the Tourism Office of Youth, Sports, Tourism, Arts and Culture City of Depok, Lukmanto, not this old. Jane Nadaek add, beside show hundreds of ornamental plant species whose numbers reach thousands of trees, Godong Ijo have excellent programs in invites children love nature. Programs are natural friends. Friendly natures of the concept, see, and feel the program is an educational environment that is packed in accordance with the child to grow flowers. "Interaction with the animals directly reptiles such as snakes, a giant lizard, turtle ashore giant learning experience and make a very valuable and unforgettable," he said. 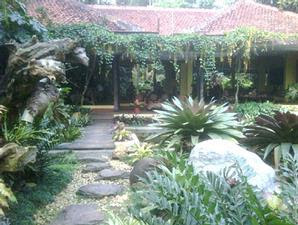 In addition to learning as a natural location for children, in Godong Ijo Asri we can also enjoy healthy food at Cafe Combrong and of course buy decorative plants, such as Adenium, Aglonema, and palm.